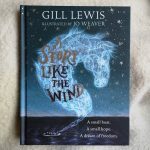 A Story Like The Wind by Gill Lewis, illustrated by Jo Weaver. I borrowed this from the library in December and couldn't face taking it back without reading it. It's utterly beautiful, both story and pictures. (It was the pictures that drew me in to begin with, as we've a picture book by Jo Weaver already, the very beautiful little bear.) The pictures … [Read more...] about A Story Like The Wind by Gill Lewis, illustrated by Jo Weaver. 300 Picture books week 2. Continuing our attempt to meet the 300 Picture book challenge. We're on track so far. Our first Judith Kerr of the year. It's not a Mog book (boo) but it does have a very Mog looking cat in it. When Willy went to the wedding. It's not his fault, honestly. Two ladybird books today, first being a Read … [Read more...] about 300 Picture books week 2.